Once again I've fallen drastically behind on the blog updating front; in part due to the absurd number of public holidays we've had recently. One of the benefits of that however is that I have a bumper Untappd Catchup for you today, which should have a heap of different beers that have come out in the last month or so. Going right back to the start of April - I visited Carwyn Cellars for a pre-footy couple of beers. One of those beers was Alvinne's Pays d'Erpigny, a Belgian Strong Ale that unlocked Sky's the Limit (Level 27) & Iron Man (Level 2). It was an interesting beer with lots of sweet malts and a touch of honey, although it finished strangely dry despite its 12% ABV. BrewDog's Self Assembly Pope, a beer from their small batch range, unlocked the Highlander (Level 7) badge. These beers all have crazy out there artwork to match their recipe ideas; this one is no exception! This was billed as a Porter infused with vanilla and coconut; it certainly delivered on the Porter and coconut parts! If you don't like coconut avoid this beer like the plague, it's massively dominated by that sweet distinctly coconut flavour. The first beer to come out of Full Toss Brewing was The Krezja, an American Pale Ale liberally hopped with Topaz and Cascade hops. I'm not sure if was partly nepotism (beer can be a child right?) but I was actually pretty impressed with it for a first up offering. It unlocked New Brew Thursday (Level 32) & Home Brewed Goodness (Level 2), a badge I'm guessing you will be seeing a bit more of in the future. The National Beer Day (2017) was unlocked by this years Bridge Road Dark Harvest. For those who don't know, National Beer Day is celebrated on April 7th each year to mark the day that prohibition was ended by the enactment of the Cullen-Harrison Act. Their fresh harvest Black IPA, initially brewed in collaboration with Mikkeller, is released annually after the Victorian hop harvest I thought this year's version was the best one for a few years and had a wonderful mix of fresh hop characteristics and roast. After one of our brewing sessions Dylan and I had a few beers that had got lost in our collective cellars. One of those to come out of mine was the To Øl/Mikkeller collaboration; Sleep Over Coffee IIPA, which would have to be at least 4+ years old! The hops had completely faded, however the beer had held up really well with plenty of sweet malts complimenting the coffee mentioned in the title. It was almost like a coffee infused barleywine. Whilst I'm not sure either brewer would've been pro-aging this beer, I'm sure they'd be pleased to know it had morphed into a really tasty beer! Better Together (Level 19) was the badge. Another clear out beer to unlock a badge was Holgate's Mt. Macedon Pale Ale, which unlocked Riding Steady (Level 40). It's a beer I've had in the past and quite enjoyed, although this offering was different... It was massively massively overcarbed! So much so that it destroyed any semblance of flavour that was there. It was so bad that we checked the dates and I'm sorry to report that it was well in date. Hopefully this is just a one batch issue, as this was a really enjoyable Pale Ale back in the day. A beer from a small Italian craft brewery; Birrificio La Petrognola, located in the triangle between Genoa, Florence and Bologna unlocked Paint the Town Red (Level 14). The beer was their Ambrata al Farro; billed as a Red Ale, but certainly more reminiscent of a Pale Ale in both appearance and flavour - with fruity hops overlaying a light malt base. I wouldn't rush out of my way to find this beer again, but it certainly isn't awful. Sierra Nevada Sidecar, their orange infused Pale Ale that featured in the last Carwyn Beer-Thusiast Pack, unlocked the NC (North Carolina) Beer Month - April (2017) badge. The NC Beer Month badge comes around most years, and is unlocked by checking into any beer from a list of breweries. As I said in the aforementioned post, the beer was boring and not up to the usual high standards that I have come to expect from Sierra Nevada. Maybe it'll appeal to others, but I thought it lacked flavour and didn't stand up to the many great Pale Ales produced in this country. Another beer laced with Brett, although this time completely deliberately, unlocked Trip to the Farm (Level 22). That beer was Crooked Stave's Colorado Wild Sage, a Brett Saison brewed with local sage and lemongrass. The flavours worked superbly, with the sage in the background whilst the lemongrass paired brilliantly with the funky Brettanomyces strain. This is one of the best beers I've had this year! Cheers to You is a badge to commemorate the day that you first joined Untappd. For me that day was April 13th, 2013. A Colonial Draught at steak night at The Botanical was the beer that unlocked (Level 4). As I've mentioned before on Beer O'Clock Australia, the beer is light bodied and has a light citrus tinge. This is further exacerbated on tap and I found it to be a far superior beer in this format; it also paired beautifully with my steak! The same level of two badges that rarely come around was unlocked by Baird Brewing Company's Shizuoka Summer Mikan Ale. The first question I had when grabbing this beer; what's a Mikan? The answer; a Japanese variety of mandarin. It's an unusually fruity citrus flavour that is complimented by some honey sweetness - and really works well on this light pale malt base. Those badges I mentioned at the start of this paragraph were Summer Fun (Level 6) & Fruits of Your Labor (Level 6). Wolf of the Willows' Wolf Blood is an Imperial Red Ale that I enjoyed on tap around it's release in March last year. They've now bottled it and it unlocked 2X (Level 18). I have to say that I didn't enjoy it much at all; something I was very surprised about - I usually love beers from these guys! Maybe it was a dud bottle? Maybe they've watered it down a bit? But this certainly didn't taste like the wonderfully balanced, big, malty, hoppy beer I had on tap last year! Birra del Borgo's beers are being seen fresh around Melbourne for the first time in years! A new one I noticed was their canned L.I.S.A. - or Light Italian Session Ale. The Gondolier (Level 13) is why you're hearing about this very tasty beer. It clocks in at 4% and packs really good bitterness considering the ABV, whilst the hops provide citrus and herbal qualities. Back to the brewery that is fast becoming my favourite; To Øl & their Dangerously Close to Stupid. It's a massively hopped Imperial IPA that unlocked Danish Delight (Level 15). It's a beer that I'm well acquainted with, although haven't sampled for about 3 and a half years. The malts are strangely light for an Imperial IPA with no real caramel or sweetness, while the hops range from lemony citrus to passionfruit and other tropical fruits. Like most things To Øl do, it's pretty awesome! Untappd Supporter (Level 3) & Rye it Up! (Level 2) were unlocked by Ryesing Tides from Siren in the United Kingdom. I love rye as an ingredient in beer, however beers are rarely categorized as "Rye Beers/IPA's" which they need to be to qualify for the badge. This was a genuinely nice beer, with that distinctive Mosaic hop flavour and good bitterness. That said; I thought it was actually lacking a little in rye, with little to no spiciness being imparted. 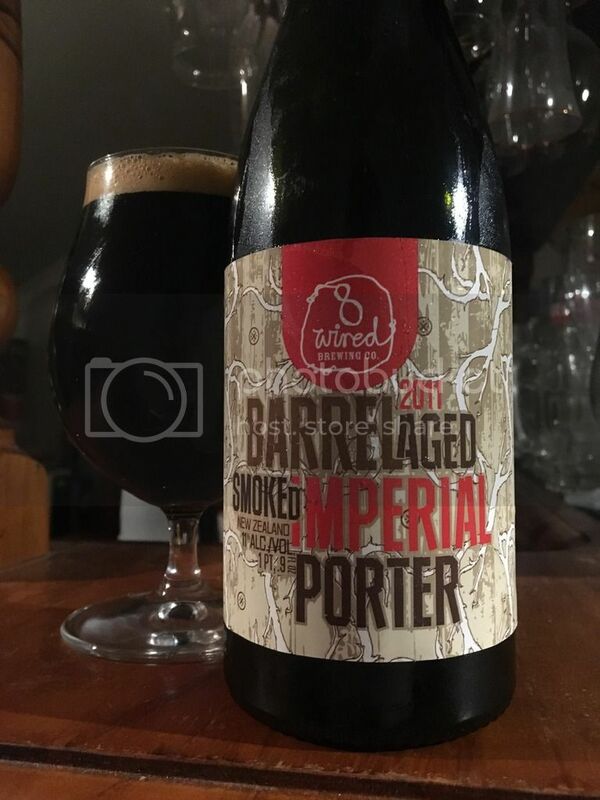 8 Wired's 2011 Barrel Aged Smoked Imperial Porter was the first beer to unlock the new To the Port badge for me. If you can't guess, the badge is for drinking Porters of all shapes and sizes. This was a seriously special beer! It had wonderfully smokiness and earthiness, which combined nicely with the chocolaty malts flavours you'd expect from the style. There can't be too many more of these floating around, but certainly don't pass one up if you come across it! Richo, myself and the girlfriends headed down to the Mornington Peninsula for a weekend away a couple of weekends ago. Many beers, wines & spirits were naturally imbibed. One of those beers; BrewFist's Spaghetti Western unlocked Better Together (Level 20) & 2X (Level 19). This was a really good Russian Imperial Stout, packed with bitter coffee flavours and roast. Later that evening we cracked a can of AleSmith's Speedway Stout that had only recently arrived in Australia (it's been here for almost a month now...). It's got all the malt complexity you'd expect of such a hyped stout and with a lovely coffee touch to boot. It's wonderful to see more and more really quality beers reaching our shores in the correct packaging to ensure maximum freshness - it really showcased itself well! Sky's the Limit (Level 28) is why you're reading about it now! The following day we indulged in a pretty serious wine tour. Before embarking on another night of really big beers; Richo and I partook in a couple of palate cleanising; Kirin Megumi's. This looks like a re-brand of their First Press, but I haven't found any definitive information on this. The Japanese beer unlocked Riding Steady (Level 42) and was actually a pretty solid, inoffensive lager. It's no so long since the Wheel of Styles badge was appearing on every Untappd Catchup post, often multiple times a post! It's quietened down in recent months however was brought out of retirement by The Bruery's White Oak; a Wheat Wine. What is a Wheat Wine I hear you ask? Simply put, it's a Barley Wine dominated by wheat in the malt bill. It's a really interesting beer with some orange, vanilla and woody flavours mixing really well with the sweet malt base. It unlocked Wheel of Styles (Level 22) if you were wondering. The Oskar Blues Barrel Aged Ten Fidy Imperial Stout was one of the most hyped beers to arrive from the United States in Australia this year. It certainly didn't disappoint, unlocking 2X (Level 20) in the process. This beer is massive in every respect! Flavour wise it's packed full of caramel, chocolate, coffee & vanilla, which sit perfectly alongside some woodiness and bourbon. Clocking in at 12.9% ABV and in an enormous Imperial Pint sized can (568ml) it's a beast not to be trifled with! Omnipollo and Buxton are regular collaborators, and bloody good ones at that! Their Original Texas Pecan Ice Cream, funnily enough from their Ice Cream Series, unlocked Swedish Brews (Level 4). The thing that gripped me most about this beer, besides the wonderful pecan nuttiness, was the creamy texture of the beer which was slightly oily - just like ice cream! The one downside of this beer was the overwhelming sweetness, it was just about fine to split with someone but I definitely couldn't finish a whole bottle by myself. I'd be lying if I said I remembered all the intricacies of Kees' Caramel Fudge Stout; the beer that unlocked Sky's the Limit (Level 29) around midnight of a very very large day! What I do remember is that it tasted exactly like caramel fudge! It was phenomenal! It also hid it's 11.5% ABV particularly well, something to be admired in a beer of this size. Untappd recently released a whole swath on new badges that you'll start to see popping up in due course. One of those was The Dark Side, a badge for drinking dark styles of beer that aren't covered by the Heavyweight badge. Their is quite a bit of cross over between this badge and two others that were released at the same time, something of a break from tradition for Untappd. In any case KAIJU! 's Cthulhu on the Moon, their phenomenal Black IPA that is coming out in cans any day now, saluted as the first beer to unlock The Dark Side badge - it definitely won't be the last! One of those badges with some overlap with The Dark Side is Black as the Night; a badge dedicated to the devilishly underrated Black IPA. Mikkeller's relatively new Hop Geek Breakfast is a 7.5% Black IPA brewed with plenty of coffee. It was a particularly bitter beer, with the coffee and grapefruit hops both adding plenty of bitterness and flavour. I thought it was a really interesting take on the style, tending more towards it's stout origins, and worthy of unlocking Black as the Night for the first time. Lervig and Boneyard Brewing's collaborative Red IPA,Viking Blood unlocked Here Come the Vikings (Level 7). I knew very little about Boneyard Brewing, but a quick check of Untappd showed over 60,000 unique check-in's - which is almost 6 times as many as Pirate Life and 4 times as many as Stone & Wood - making it a pretty big brewery! Enough of that; the beer was a real winner, with nice malt/hop balance and excellent bitterness. I can't help but feel a touch more malt would've added body and richness and really made it a top example of the style. Fourpure Brewing Co.'s beers are popping up with more regularity in Australia now. I sampled their Tennessee Coffee Ale on tap at Dr. Morse a few weeks ago during a particularly dry work meeting. I really enjoyed this Brown Ale, with pronounced coffee flavours balanced by some earthiness and bitterness. This beer unlocked two badges; New Brew Thursday (Level 33) & God Save the Queen (Level 40), and would be a perfect companion by the fire on a cold evening. Two venue badges were unlocked in one check-in by Stone & Wood's Garden Ale. Verified Adventure (Level 3), a badge recognizing good beer venues registered with Untappd - skipped to level 3 due to a venue recently registering, and Beer Foodie, for drinking beers at venues classified as restaurants. I've spoken about this beer many times before; it's a simple mid-strength that does the job and I enjoyed it in the beer garden at The Great Northern watching the footy. One of the beers from the last Beer-Thusiast Pack; Oskar Blues Pinner was the next beer to unlock a badge; Riding Steady (Level 43). This beer thankfully was far better than the Passion Fruit Pinner that Dylan and I sampled a few months back. This clocks in at 4.9%, a bit higher than what Australian's would generally term a "Session IPA", however it drinks like one with nice punchy bitterness. I could definitely envisage myself drinking many of these if they were fresh one afternoon. Another beer from Oskar Blues unlocked 2X (Level 21). That beer was Deviant Dale's, Dale's Pale Ale's bigger brother. For an 8% Imperial IPA this beer has never grabbed me. Sure it's got heaps of resinous pine bitterness, but it's a relatively single dimensional beer with sweet malts being the only other real flavour point of difference. For me; I think there are better beers on the market in this category. Another To Øl beer to unlock multiple badges, these been a few over the last couple of months, was Gose North. This was a lovely example of the style; packed with citrus flavours and aromas as well a fruitiness that might be peach. There's also a good amount of wheat, tartness and salinity. Personally I don't think there's a lot more you could ask for in a Gose than what Gose North offers. The badges? What Gose Round (Level 7) & Riding Steady (Level 44). Das Boot (Level 12) was unlocked by Gänstaller Bräu's Schwarze 90, a German brewed Russian Imperial Stout. Interestingly the bottle states it as an Imperial Stout Lager - something that requires further investigation when I'm less busy. The beer itself was quite tasty with licorice flavours combining nicely with traditional smoke and malt. The carbonation was on the low side, which suited the beer, whilst the body was a touch too thin for the ABV in my mind. Finally we've reached the last beer in this Catchup! Cricketers Arms Spearhead unlocked a new badge for me; Big Game on the Big Screen. This is a badge for drinking at venues classified as Sports Bars. The pub; Courthouse Hotel in Sydney, the event; pre-match A-League Grand Final lunch. The beer; wasn't bad, the food; was pretty good, however the result at Allianz a few hours later didn't go our way... Still a phenomenal weekend regardless. I can't believe this got as out of control as it did! I've already started work on the massive Good Beer Week Untappd Catchup that will hopefully be up in the coming days. I've somehow survived the week, something that appeared questionable at times. With any luck you'll see quite a few posts in the ensuing fortnight as I've got a little lull in my workload. In the meantime guys, I will get to all your emails sometime before the weekend!